It seems that lately all of my friends are posting their new ultra sound pictures, belly shots, or new baby pictures....so we thought we'd join in on the fun! HAHAHAHAHA!!! Hope you enjoyed our little miracle! Ha haha! That is HILARIOUS!!! 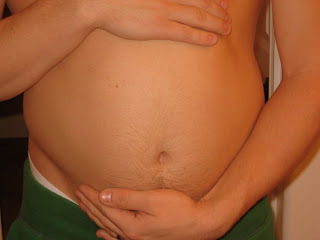 Brett I never thought that you had the potential for a Haakon belly but...... ha ha! I obviously need to post a pic of my belly (um.... not like yours, I mean clothed....) because my belly has exploded this month! EeeeeK! thanks for making a prego lady laugh! ha ha! Brett, i must say that is a little creepy and i'm left wondering how on earth you were able to do that! Hahah this is SO funny! 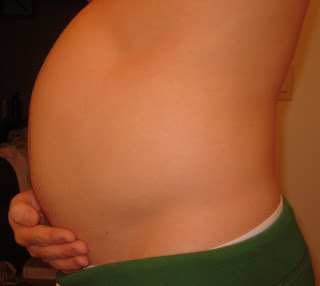 I heard you have to have really strong ab muscles to be able to do this...forget a 6-pak the prego belly is where its at!! ROFL!!! Ok... those are WAY too funny :D I'm glad you guys were able to participate in the pregnancy fun haha!!!!! Oh my goodness, I laughed so hard out loud at work! You guys are hilarious! That first picture had me wondering! About the great deal...never thought I'd find one like that, but now I know thy're really out there. So, I was in the land of Nicaragua when you posted this. But, seriously I about peed my pants with laughter! We seriously need to get together! Maybe you and Brett need to take a vacation to St. George, and I promise that this time, Cameron won't be proposing so we really can get together!! Pretty dang funny...and a little scary! (-: Luckily for both of you Al will make the cuter pregnant person when the time REALLY comes! LOL! Oh my heck Lex! That's too funny. That first one is acutally pretty realistic. Oo..speaking of boys...how is John and Jamie? Do they have a blog? Hilarious!!! And disturbing! And WOW! :o) You guys have too much time on your hands! HAHA!